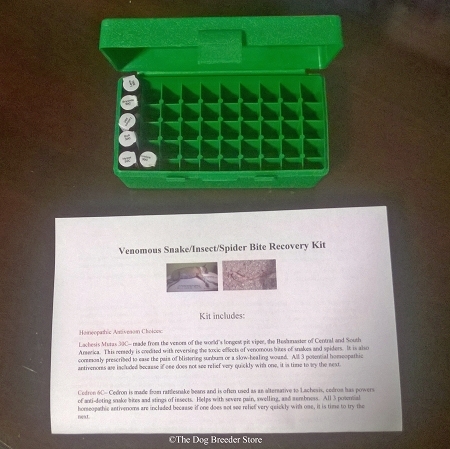 Born of experience with two boxers who were bitten by venomous snakes in October 2014, this kit contains the remedies that have potential to turn a crisis into recovery in a very short time. Seven year old boxer Ginger was apparently bitten on her front right lower leg by baby copperheads or rattlesnakes based on the symptoms and fang mark distance. 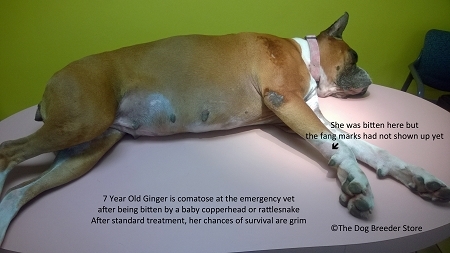 Ginger was rushed to the emergency veterinary hospital and gurneyed inside unconscious. Her situation was triaged and the veterinarian provided pain medications, steroids and anti-inflammatories. She was later sent home with her prognosis uncertain for survival. We were told to seek anti-venom treatment as soon as possible and expect that if she lived, she might lose a large amount of flesh around the fang incisions. Five year old Dash was apparently bitten by a larger venomous snake in the side of the face, as evidenced by a very large fang hole in his left cheek that resulted in severe pain and swelling about the head and neck. He was also prescribed the same treatment but we did not accept the steroids and antibiotics because he was not as critical and we do not typically use these as natural rearing breeders. He received homeopathics for pain support and swelling instead. We located a source for traditional antivenom. However, we were told that administration could potentially do more harm than good, and also might result in death. Administration of anti-venom was quoted at $4,000 for both dogs for the initial treatment and potentially more. Money was not the object at that point, but the potential to worsen the situation was what held us back to continue researching. While we searched for alternatives throughout the night, we provided as much support as possible using compresses of Bentonite Clay soaked in Mendwell over the incisions, homeopathic Hypericum for deep pain relief, homeopathic Arnica to reduce swelling and provide some pain relief at the incision site, homeopathic Ledum to reduce swelling, and homeopathic Echinacea to prevent infection. Dash's swelling receded after administration of Ledum and it was evident that pain relief was working, yet Ginger drifted in and out of consciousness and showed no other visible signs of improvement. She was nearly comatose, although she did vomit profusely before collapsing. Research finally revealed that I actually had one potential remedy on hand in my Top 100 Homeopathics Kit. My 3 choices for homeopathic anti-venom were Lachesis, Crotalus, and Cedron. I learned that I could dose one of the homeopathic choices, wait 15 minutes for improvement, then try the next choice if I saw no changes. Fortunately, my first choice of Lachesis caused Ginger to sit up within 15 minutes. A second dose resulted in her getting up and walking around. A third dose resulted in tail wagging and wanting petting. A fourth and final dose resulted in Ginger eating a hearty breakfast and running outside to play as if nothing had happened. I am not a licensed veterinarian nor a professional homeopathic practitioner. However, I have studied homeopathics and seen miracles occur when using my little Kit. I consider it the most important single investment I’ve made in healing animals and people, and even carry it with me when I travel. I was hoping for another miracle and I got it with my Kit. After pondering the success of this protocol and consulting my own veterinarians, I was convinced that I should offer a Venomous Snake Bite Kit that people could have on hand in the event of a venomous bite from snakes or insects. This is a Kit I personally would use on myself if I were bitten rather than go to the ER. I’m not recommending that you avoid competent professional medical intervention, but my own experience tells me that I would try this now first before trying to drive to the ER or loading my pet up for the long and expensive trip that may or may not be successful. Time is of the essence in these situations, and trying the Kit first at home may just be the difference between quick recovery and potential catastrophe to both the victim and your wallet. Even using the remedy while enroute to the ER may provide the opportunity to turn back home before arriving. We also recommend that you have Bach Rescue Remedy on hand for fast relief from the emotions of stress/trauma/shock. Disclaimer: Any information given in this website is not intended to be taken as a replacement for medical advice . The Dog Breeder Store does not diagnose or treat illnesses or injury in pets and accepts no liability for results that are less than optimal, injury or death relative to use of this product or instructions. Consult a licensed veterinarian if you suspect that your pet is experiencing pain or infection. 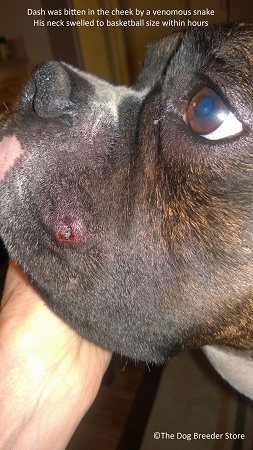 My 15 month old Boxer "Fire" was bit by a venomous snake (not sure what species, as we didn't see it) the morning of March 31st. Minutes later she was three legged lame, due to the left carpal area bite. Two minutes later she was in severe shock, mucus membranes white as a sheet. I administered a subcutaneous injection of Flucort, and drove her to the Emergency Clinic. Her leg swelled to 3-4 times its normal size, it was extremely painful, and edematous, my puppy was critical. I wish I would have had this snake bite kit to use immediately. Two hours later we brought her home from the Emergency Clinic as they closed at 8am, and I messaged Paula about the kit. She graciously agreed to make a house call. She applied the homeopathic remedies and we watched Fire brighten up, and begin to be interactive, as Paula proceeded with essential oils. It was an amazing transformation that I witnessed with my own eyes, the swelling started to subside and Fire was more comfortable. She has made a complete recovery and we feel so blessed. Thank you Paula, for this life saving remedy. This stuff works!!!!! My dog was bit last night by copperhead and within 2 hijrs of using the sname kit his swelling was almkst gone & the pain completely went away!!! Thank you Paula for this kit, it saved Xander's life!!!! While I was on a hunting trip in Brady Tx, a friend of mines dog was bitten several times by a few Rattlesnakes that we flushed from their den. He took his dog to a vet clinic and they said there was nothing they could do. I gave the dying dog a few of the pellets that I received from the Venomous Snake and Insect Bite Kit from this store. They truly work miracles. The dog was back to its old self very quickly. Thank you for making an amazing product! Why is it the week that you are gonna show (after NOT showing for a while) your pup decided to get into something or fight with something with a stinger!? Good grief ?? Swollen lip, throat...thanks to Paula Vandervoort Anti-venom Snake/Insect kit...swelling & back to normal within 45 mins!!! First tried Benadryl, cause I panicked but she kept throwing it up. That's not gonna work and Boom! The Dog Breeder Store Snake Bite Kit!!!! Lol Thank you Paula!! ?? Highly recommend everyone to have it on hand! Add a small capful of pellets to gum or pouch of mouth and rub gently. Swallowing is not mandatory. The amount given is less important than the frequency and use of the remedy or remedies that provide observable improvement. Remedies can be dosed as frequently as once every 15 minutes until relief is observed. Lower potency remedies such as 30C are dosed more often. Higher potency remedies such as 200C are typically only dosed once. Like all homeopathic remedies, the ingredients in this kit have undergone extensive series of successive dilutions before being used. Only infinitesimal amounts of the poison remain in the final preparation. Because of this extreme dilution, commercially available homeopathic preparations are considered to be safe. We only procure from reliable homeopathic pharmacies. Lachesis Mutus – made from the venom of the world’s longest pit viper, the Bushmaster of Central and South America. This remedy is credited with reversing the toxic effects of venomous bites of snakes and spiders. It is also commonly prescribed to ease the pain of blistering sunburn or a slow-healing wound. Lachesis, Crotalus and Cedron are included because if one does not see relief very quickly with one, it is time to try another. Crotalus Horrodus– made from rattlesnake venom, crotalus is known to help with hemorrhaging, paralysis, paralysis, headache, and even hallucinations caused by venom. If your pet seems “out of it”, this is the remedy to use. Cedron – Cedron is made from rattlesnake beans and is often used as an alternative to Lachesis, cedron has powers of anti-doting snake bites and stings of insects. Helps with severe pain, swelling, and numbness. Lachesis, Crotalus and Cedron are included because if one does not see relief very quickly with one, it is time to try another. Ledum Palustre – owing to its antiseptic properties, ledum is useful in preventing any type of infection and is thus a vital component of the first-aid remedy kit. It known to be especially effective with puncture wounds and it has been found that injuries or stings that have acute bruising accompanied by puffy and purplish skin can be healed effectively with ledum. Ledum has even been known to prevent tetanus in some cases. Hypericum – known for its ability to relieve excessive pain, hypericum is included in the Kit to relieve the shooting pain associated with venomous snake and insect bites. Although Arnica Montana can be used as a substitute, Hypericum is more often prescribed for the intense pain that one may experience when venom has been injected. Echinacea Angustifloria – used commonly to prevent infections from snake bites and venomous stings, homeopathic Echinacea Ang can start your pet on the road to recovery very quickly.